Last weekend, from 10th until 12th June, the Queen celebrated her 90th birthday. Tens of thousands of people came to London to celebrate with her. On Saturday, there was the traditional “Trooping the Colour “ parade; on Sunday, the big charity picnic “The Patron’s Lunch” took place. We created a set of keywords for the Queen’s birthday and analysed, who dominated the Google News Boxes. The set of keywords we looked at, consisted of 16 keywords, like for example “Queen 90th Birthday”, “Queens’s birthday”, “Queen’s Birthday June 2016”, “Trooping the Colour” and so on. We chose the days of the festivities as our time frame, that is Friday until Sunday. The following chart shows that the BBC held the highest share in the Google News Boxes. They made it to the 1st place with a visibility of 32.1 percent, followed by The Mirror with a visibility of 12.4 percent, and the Telegraph with 11.3 percent. 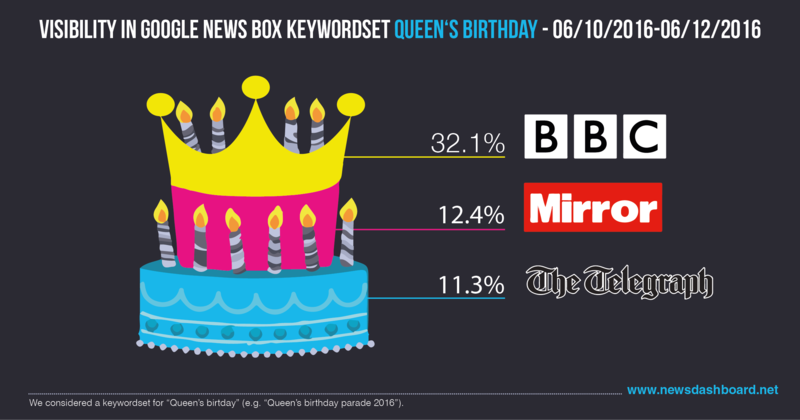 BBC, Mirror and The Telegraph win the Google News Boxes for the Queen’s birthday celebration. So there are no big surprises so far. The BBC is and will be the strongest news publisher in Google News UK – also regarding the Queen’s birthday. The Mirror and The Telegraph were very successful in Google regarding this topic, and regarding many others. The excitement grows when we look at the top 10 of the news publishers of that weekend. Place 5 is held by ibtimes.co.uk, i.e. the International Business Times. Usually, this page reaches a visibility of less than 1 percent in the Google News Boxes (regarding all keywords from Google News). During the festivities of the Queen’s birthday, ibtimes.co.uk was able to catch up immensely and reached a visibility of 4.5 percent. A remarkable number. An American publisher was also able to reach the top 10: cnn.com with a visibility of 3.7 percent. Other news publishers in the top 10 are dailymail.co.uk, sky.com (British page), independent.co.uk, theguardian.com, and standard.co.uk. The BBC had by far the highest visibility in the Google News Boxes. Now we take a look at the big military parade on Saturday, 11.6.2016. Which news publisher was in the Google News Boxes, and when? Were there differences for two different ways of spelling the keywords? For this purpose, we look at the Google News Boxes for the keywords “Trooping the Colour” and “Trooping the Colour 2016”. The BBC dominates position 1 of the News Box nearly all day. Here, too, does the BBC dominate position 1, but there is high fluctuation on positions 2 and 3. At a first glance, there do not seem to be any differences for position 1 in the two News Boxes: bbc.co.uk held the first position for the biggest part of the day. But there are differences regarding the second and third position. While sky.com was on position 2 for the keyword “Trooping the Colour” between 3 a.m. and noon, there was a higher fluctuation for “Trooping the Colour 2016”. There, ibtimes.co.uk, mirror.co.uk, dailymail.co.uk, and huffingtonpost.co.uk alternated on the second place. Towards the afternoon, it was the other way around: While telegraph.co.uk was able to hold the second position in the Google News Box until late in the night for the keyword “Trooping the Colour 2016”, there were more variations for the keyword “Trooping the Colour”. There, dailymail.co.uk, sky.com, mirror.co.uk, and telegraph.co.uk alternated on the second position in the Google News Box. The results show once more that it can be worth it to consequently use a way of spelling that is different from the other news publishers. Ibtimes.co.uk for example is almost not at all present in the News Box for “Trooping the Colour” (only between midnight and 2:45 a.m.), but ibtimes.co.uk was present in the News Box for “Trooping the Colour 2016” until noon.